Eltronicschool. 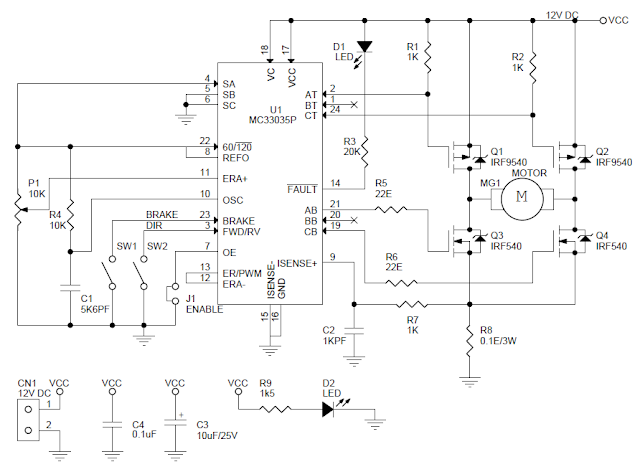 - Maybe you are still not familiar with this title that called DC motor controller with brake for your electronic project. But, in here we will really using term brake for DC bursh type motor and direction controller using MC33035. We aren't forgot that here, we will show you one electronic circuit scheamtic of DC Bursh Type Motor and Direction Controller with Brake using MC33035 IC like the Figure 1 below. And the main component used in this circuit is MC33035 IC. Circuit schematic like in Figure 1 above is DC Bursh Type Motor and Direction Controller with Brake using MC33035 IC. We mentioned again that the main component here is MC33035 IC. This component usually are be used to controll burshless DC motor, but this iC also can be used to controll usual DC motor like in Figure 1 above. According Electronics-Lab site describe that MC33035 driving a Mosfets based H-Bridge affording minimal parts count to operate a brush type motor. On board potentiometer provided for speed control, slide switch for direction control and brake, On board jumper available to enable the chip. The controller function in normal manner with a PWM frequency of approximately 25Khz. Motor speed is controlled by adjusting the voltage presented to the non inverting input of the error amplifier establishing the PWM’s slice or reference level. Cycle by cycle current limiting of the motor is accomplished by sensing the voltage across the shunt resistor to the ground of H-bridge. The overcurrent sense circuit makes it possible to reverse the direction of the motor, using normal forward/reverse switch, on the fly and not have to completely stop it before reversing.